Working from a model piece pasted up on the window, Murphy, along with Derek, a junior at Wellesley High School, helped about thirteen kids cut and paste together a picture of pointed purple peaks that towered above green, fruited plains of construction paper. “Does anybody know where these mountains are? They’re not in Massachusetts,” Murphy asked the group. “They’re the Rockies!” somebody exclaimed. Singing together and to themselves in hushed voices, the kids worked diligently away, cutting, tearing and gluing their own rendition of the mountainous scene. There were also images of Bates with her dog, Hamlet, and parrot, Thelonious, for the kids to color, and mad-lib style lyric sheets for the kids to pen their own version of the song. 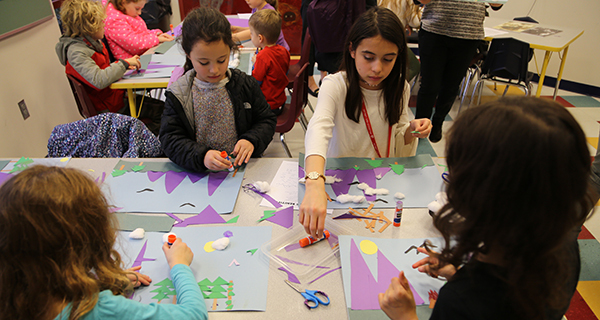 Held on January Wednesdays every year and sponsored by the Massachusetts Cultural Council and the Wellesley Historical Society, Winter Wednesdays strive to teach kids about their town’s local history in a fun and interactive setting. The Historical Society will be hosting their final installment of Winter Wednesdays on January 30 at 1:30 p.m. in the library.